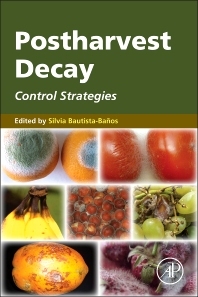 Written by a diverse group of research professionals, Postharvest Decay: Control Strategies is aimed at a wide audience, including researchers involved in the study of postharvest handling of agricultural commodities, and undergraduate and graduate students researching postharvest topics. Growers, managers, and operators working at packinghouses and storage, retail, and wholesale facilities can also benefit from this book. The information in this book covers a wide range of topics related to selected fungi, such as taxonomy, infection processes, economic importance, causes of infection, the influence of pre-harvest agronomic practices and the environment, the effect of handling operations, and the strategic controls for each host-pathogen, including traditional and non-traditional alternatives. BSc. in Agronomy. Autonomous Metropolitan University. MSc. in Tropical Fruit Production. National School of Fruit Production. PhD in Plant Sciences. Massey University. Research interest in control of postharvest microorganisms in horticultural commodities and edible flowers by mean of sustainable alternatives.